Much of our industry's obsession with French fashion can be pinned on the Parisian pinups of the past, with Brigitte Bardot's style being at the epicentre of it all. The actress/model/singer's on- and off-screen looks are indelibly marked in the history books, and so many of her choices are iconic today—who doesn't know the headband-and-Breton getup from Le Mepris? While Jane Birkin will forever be referenced in regard to straw baskets, it's Brigitte who you'll be able to imagine reclining on a beach towel wearing the simplest but most impactful bikini you've ever seen. We took a dive into the archives to look at the common threads that run through Brigitte's best outfits so that you can piece together a modern version of her trusty wardrobe. True, there were many times where Brigitte was entirely naked (well, the '60s were a radical time in the movie business), we've found the five key pieces you need to re-create her best moments, and you can see the proof below. Keep reading to see Brigitte Bardot's signature style in action. Style Notes: Airport style, 1967 edition. 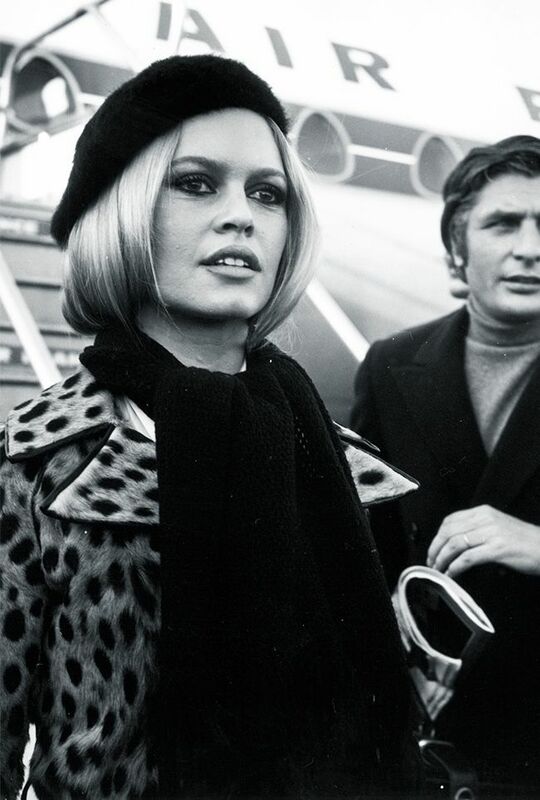 Brigitte flew in a leopard-print coat and beret to London, and it's an outfit that wouldn't look out of place in Heathrow again today. Style Notes: Making everyone want a wide-brimmed straw hat via her wardrobe on the set of Viva Maria. Style Notes: You know this year's rise of the "Instagram hat"? This flower-adorned piece, worn on set for the filming of Vie Privée, would be a prime contender on social media today. Style Notes: Spanish-inspired dresses were an important part of Brigitte's look in the '60s. Style Notes: The model/actress/singer knew how to pose like a pro—working the hell out of those girlish pigtails and a matching gingham dress. Style Notes: This red frilled dress was an iconic look from the film La Femme et Le Pantin. Style Notes: If this doesn't immediately make you start matching your knitwear to your hairbands, nothing will. Style Notes: Even when cycling and wearing the plainest clothes, Brigitte looked alluring. Style Notes: Suede jeans, a chunky belt and a cosy crew-neck feels like a formula we'd like to wear this winter. Style Notes: Can a swimwear designer please hear our cry and make this one-piece for next year? Style Notes: Just like Bella Hadid, Brigitte also liked wearing jewellery with her swimwear. Style Notes: A little white bikini—what could be more Bardot come summertime? Style Notes: The seminal Brigitte outfit from Les Mepris included a thinly striped Breton. Meanwhile, a cardigan has never looked more tempting. Style Notes: Another day, another striped piece and another cardigan. Style Notes: This nautical sweater was part of Brigitte's wardrobe for A Coeur Joie. Next up, the French fashion brands on our radar.